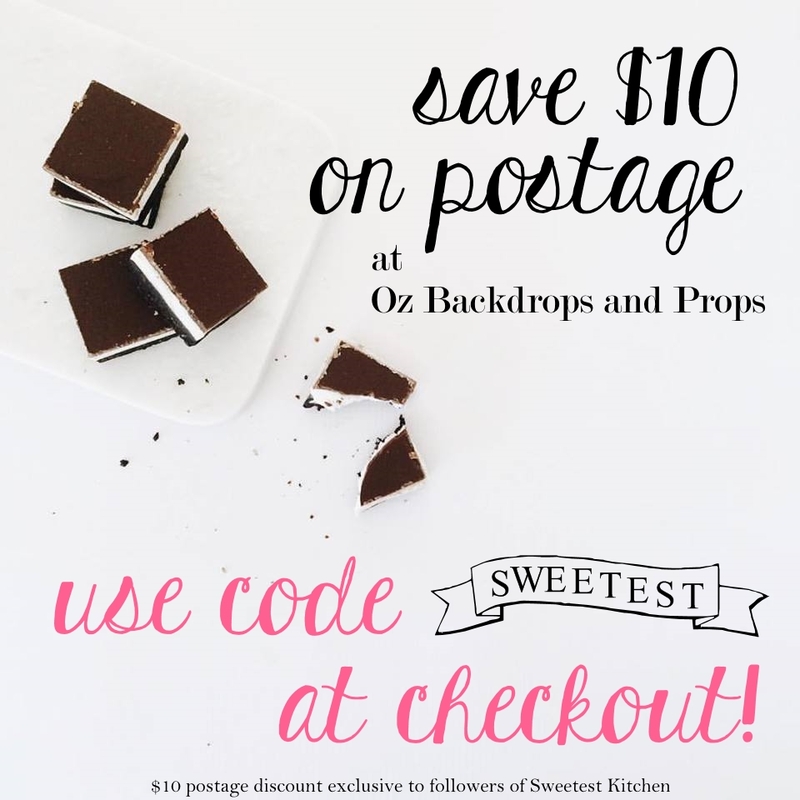 So I lied – I do have some cupcakes for you after all! Watermelon ones – cross section is pictured so it would look more watermelony. I thought it was a cute idea that I had for these watermelon cupcakes, so had to try it out. I used Magnolia Bakery’s vanilla cupcake recipe, but halved it to get one dozen cupcakes instead of two (though I ended up with 14, actually). I added 10 drops of red food coloring (give or take a drop) and 1/4 cup plus a tablespoon or so of mini chocolate chips. I then used the watermelon frosting I found here. Though the taste of the frosting was nice with a subtle hint of watermelon, I was disappointed that it was too liquidy to pipe at all, even after refrigerating, so had to just sort of pour it on the cupcake. Because there is cream cheese in the frosting, I am refrigerating the leftover cupcakes so it should harden up a little, I presume. And even though the watermelon juice turned the frosting a light pink color, I wanted it green so added a few drops of green food coloring to turn it this pastel green color. I’d like to find a watermelon frosting that is pipeable, so if anyone knows of one, please tell me! If I could have piped this I would have liked to split the frosting into two parts – one the light pink color and the other the light green color, then put the two colors into a pastry bag to get a swirl effect. 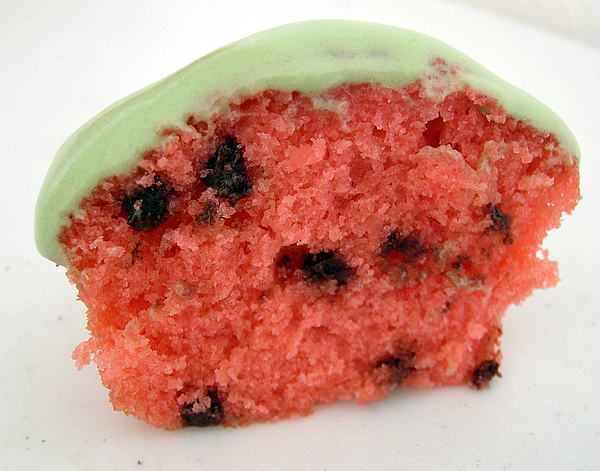 Also what might be nice is a cute little slice of watermelon made out of fondant, placed on top of the cupcake. Thank you to Cupcakes Take The Cake for posting about my watermelon cupcakes on their blog! By far the most unique and original Watermelon cupcake I have seen yet! Well done! looks very appetising! what do you mean about having 2 colour swirls? would it be possible to alter the recipe that you used to make it pipable(is that a word?) by changing the amount of sugar or something? A perfect summer treat. Brillant job! 2)use watermelon juice to reconstitute powdered eggwhites instead of water (this has worked for me with orange juice and champagne), then make an eggwhite based frosting like a swiss meringue butter cream. This looks delicious, are you entering it into this month’s cupcake hero (the deadline to enter is today)? I could have added more sugar, but I didn’t want to cover up the subtle taste of the watermelon in the frosting. Amicus Cupcake, I like your idea for the Swiss meringue buttercream. I’ll write that down on my recipe card. And I’ve never heard of Cupcake Hero, where do I find it? Do you think this could work with Watermelon Schnapps? Cute watermelon cupcake! You’re very creative!